Along with Elvis Presley, the Beatles, and a few select others, Jimi Hendrix falls into that category of the rock and roll canon. Even if you know nothing about him (and I knew very little before this week), anyone with even a passing familiarity to rock music grows up respecting Hendrix as one of the Greats with a capital "G."
In a way, this makes it somewhat difficult to cast judgment on his music. It's like reading War and Peace and criticizing Tolstoy, or finding something wrong in a work by Michelangelo. On one hand, we all have our sincere and honest reactions to works of art. On the other hand, who the hell are we to criticize anything that generations of far more knowledgeable fans and critics have accepted as universally great? So it's something I struggle with I listen to Jimi Hendrix (and other artists of his caliber). I find it easy to cast judgment on musical acts from the past decade or so; I feel like these are part of my generation and it's within my rights to throw out my opinion. However, the further back I go and the more important the figure, the more I feel silly about having anything to say at all. I suppose I just have to remind myself that I'm not a music critic and certainly not casting any sort of objective judgment on these groups. Rather, I'm just trying to piece together my own reaction as honestly as I can. Also, I liked Jimi Hendrix, so I don't have to cope with any feelings of lingering guilt. WHAT I KNEW BEFORE: I was familiar with most of Hendrix's famous singles, from "Purple Haze" to "All Along the Watchtower." Also, I had a middle school music teacher who considered it his duty to give us the basics of rock and roll history, so I knew somewhat about Hendrix's life and untimely death. MY LISTENING: I listened to Are You Experienced? (1967) every day this week. Travels and a busy schedule impeded on my secondary listening somewhat, but I managed to listen to Electric Ladyland (1968) twice and Axis: Bold as Love (1967) once. Let's start with the obvious: Jimi Hendrix is a very good guitar player, and a versatile one at that. I liked his ability to throw out an epic and apocalyptic guitar solo on a song like "All Along the Watchtower," a catchy bluesy riff on "Purple Haze," embark on a fast-paced rocker like "Crosstown Traffic" or take his time to explore on the fifteen minute "Voodoo Chile." Hendrix is a hell of a guitarist, but he's not a one trick pony by any means. These aren’t your classic stadium rock guitar solos, where everyone holds up their lighter and sways to the melody. Rather, the guitar part is almost perfectly integrated with the song, as in “Purple Haze”, or it serves to punctuate the lyrics, as in the strangely minimalist “Fire”. Some of his songs are completely dependent on the guitar, and that's okay - "Voodoo Chile (Slight Return)" might be one of the best of these. But Hendrix never uses his crazy guitar tricks as a crutch for lazy songwriting, either. From the hot and energetic "Fire" to the somber, melancholic "Hey Joe," the group is able to imbue all sorts of emotions into their material. Still, the overarching aura of Hendrix songs is that of hazy psychedelia. By listening to some of these songs, one feels connected to a whole new world, a completely different experience, and the music speaks as something far more knowledgeable than the listener. Songs like the aptly named "Are You Experienced?" and the short, direct "Little Wing" seem like the closest route to experiencing the psychedelic sixties without actually doing drugs. Something about these songs manages to convey to foggy uncertainty of the time in a way I can't do justice. 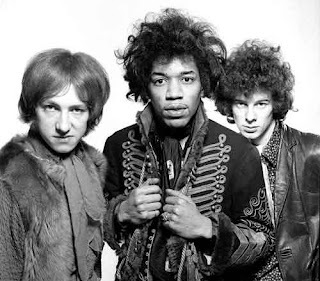 Finally, though Jimi Hendrix is the primary figure, I would be amiss if I didn't mention Mitch Mitchell's drumming - it's just as good as Hendrix's guitar. Fast and full-bodied without ever being overpowering, Mitchell can pound out a great beat ("Fire," "Manic Depression") or also take it slow and laid-back when necessary. Let's not forget the rhythm section as a major portion of the success of the Jimi Hendrix Experience. Though I mentioned the hazy psychedelia above, there were a few too many times that the music felt like a drug-induced stupor. These moments - rare on Are You Experienced? - unfortunately became much more prevalent on Electric Ladyland. The worst track on Are You Experienced? is easily "Third Stone from the Sun," a strange space-age piece of nonsense that Hendrix mumbles through for far too long that never really goes anywhere. The sins of Electric Ladyland are even greater (though, arguably, the peaks are higher as well). The album begins with the experimental reverb of "...And the Gods Made Love" which, to his credit, Hendrix included as the opener so that listeners could get it out of the way as fast as possible. But by the time the album reaches it's third side, tracks like "1983 (A Merman I Should Be)" seem self-indulgent and best appreciated on a level of consciousness that is probably illegal. Electric Ladyland's problems go beyond mere psychedelia. While I appreciate a good bluesy solo as much as anyone, Hendrix goes a bit overboard. Do we really need "Rainy Day, Dream Away" and "Still Raining, Still Dreaming"? I'm sure some die-hard Hendrix fans will tell me otherwise, but my answer is an emphatic "no." FURTHER EXPLORATION WOULD ENTAIL: Jimi Hendrix would later collaborate with the Band of Gypsies for one album in 1970. There are also a few live performances that might be worth checking out, such as the one at the Monterey International Pop Festival, to see what Hendrix's music is like without the plethora of studio effects at his disposal. BEST SONG YOU'VE HEARD: "All Along the Watchtower"
Yes, it's better than Bob Dylan's version. End of story. BEST SONG YOU HAVEN'T HEARD: "Red House"
I really like the combination between hard rock and blues, and Hendrix does it great in this song.